On Friday, Feral Anthem plays their first show since releasing their debut album. January 16, the day we meet at Wild Bill's Long Bar in Cheney for an interview, is Jeremy Rouse and Caitlin Garpestad Rouse's five-month wedding anniversary, a realization the pair celebrates with a high five. 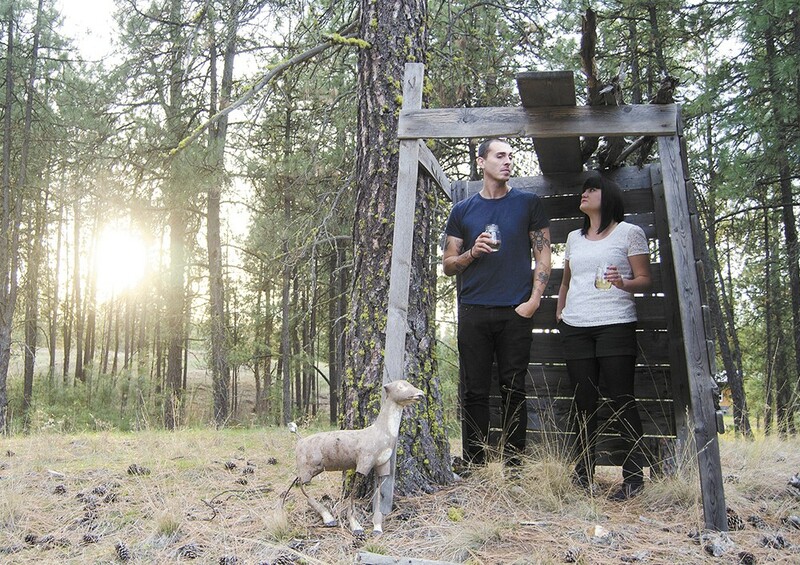 The laid-back couple, who perform as roots-punk duo Feral Anthem, met in Spanish class at Eastern Washington University and were together for five years before tying the knot in August. Jeremy performed in punk and reggae bands before releasing music under the name Citizen Arms, while Caitlin has always sung — but usually in private. It wasn't until the pair recorded a cover of the Clash's "Straight to Hell" that they realized they had something. Over time, Caitlin's increasingly more frequent contributions necessitated a name change, and Feral Anthem was born. According to Caitlin, her husband doesn't think she's a good bandmate. But Jeremy insists it's because of his years spent writing music as a solo artist. "I've had to relearn how to ... work with other people, trying to get a song put together," he says. "And we have different styles of putting them together," Caitlin adds. "He's very much 'Let's just try this now!' and I would rather listen to it and figure out my own part on my own." Even so, both husband and wife are quick to joke that if it weren't for their marriage, the band might not be together. "Being married helps because we have a lot of fights when we're playing music," Jeremy says. "If we weren't shackled to each other, then we might just quit the band altogether." "I was going to say 'If we didn't like each other,' but same thing," Caitlin adds. On paper, Jeremy's rousing, raspy voice and Caitlin's more soulful vocals seem discordant, but the couple uses their differences for their benefit. And whether out of obligation or not, there's no denying the pair's musical chemistry. The band's latest release, Ballast & Bone, is a collection of tunes that offer a gritty look at daily life. Some, like "Banks of the Rio Masacre" and "Mackandal's Body," are inspired by trips to the Dominican Republic, Haiti and Nicaragua. And "Low as Lions," which Jeremy jokingly wrote for his wife, is a breakup song. Admittedly, the duo doesn't have arena-sized ambitions for Feral Anthem; they're content maintaining the DIY style that has worked so far. "The focus is continually getting better, continually trying to write songs and record on our own terms," Jeremy says. " ... and try not to kill each other."